Environmental accounts provide the information necessary for society to understand the current state and trends in condition of land, freshwater, coastal and marine resources, at scales appropriate for informing policy and investment decisions. Between 2011 and 2015, NRM bodies across Australia participated in a Regional Environmental Accounts trial, in conjunction with NRM Regions Australia, the Wentworth Group of Concerned Scientists, universities and government agencies. The trial tested the environmental accounting framework called Accounting for Nature (2008), and the necessary processes and procedures to implement a national program of environmental accounting in Australia. 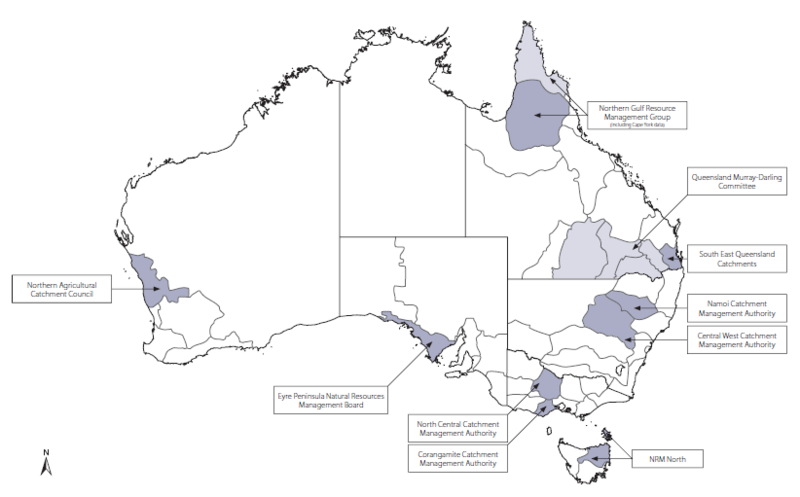 Ten NRM regions compiled regional accounts using the asset condition accounting method described in the Quick Guide (2013). This method used a common unit of measure, the Econd, to quantify the condition of environmental assets. Accounts produced during the trial were developed for assets within land, freshwater, coastal and marine environments. Accounts were reviewed and accredited by scientific committees following the Accounting for Nature model, to provide credibility and confidence in the data for decision making. Ten NRM regions participated in the Regional Environmental Account Trial, by developing condition accounts for key environmental assets in their region. The trial successfully demonstrated the utility of the Accounting for Nature approach, as outlined in the reports Evaluation of the Australian Regional Environmental Accounts Trial and the Technical Analysis of the Australian Regional Environmental Accounts Trial. These reports also document the lessons learned, key findings and contributions from the trial towards the field of environmental asset condition accounting. The trial demonstrated that it is practical and feasible to create asset condition accounts using a common environmental currency to simplify nature’s complexity without reducing the rigour of scientific measurement. This information is critical for informing complex natural resource management, policy and investment decisions at multiple scales.